Bianchi's convenient belt-mounted holder, from its trademarked PatrolTek line, holds one miniature flashlight and allows for comfortable hands-free carry while still leaving it within easy reach. 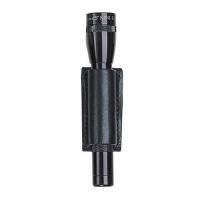 The holder accommodates most AA-cell flashlights and attaches to the belt with ease utilizing the snap-on loop feature. The holder fits belts of up to 2.25" in width. Crafted from Bianchi's durable gun leather and available in basket weave or plain leather finishes, this holder can withstand the rigorous demands of law enforcement work without loss of functionality or damaging your light.